crafting with katie: Many Thanks! I found a fun card in Cricut "Make It Now" and discovered that if I made it without using the included arrows (which I did not own), I could make it for free! Not a problem, since I have plenty of arrow dies. 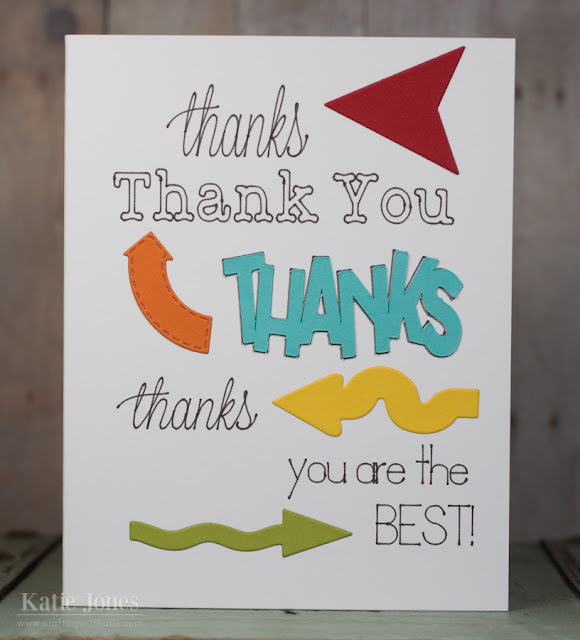 So my Cricut did all of the writing and cut out "thanks," and then I used My Creative Time's Stitched Mini Frame & Arrow Dies for the orange arrow and Papertrey Ink's Get to the Point for the rest of the arrows. Super easy for a fast thank you card! MCT 56th Edition Release Blog Hop!